Plenty of mixed reaction ensued when Finance Minister, Jim Flaherty, last week announced the new mortgage rules that are meant to avert the burst of the much deliberated “housing bubble” and to help Canadians lower soaring household debt. – Government-insured mortgages will be amortized for only 25 years maximum, rather than for 30 years, which has been standard for some time now. The only exception will be for homebuyers who are able to fork over a down payment of 20% or greater. – Lenders will no longer be able to issue home equity loans at 85% of the property’s value. The maximum will now be 80%. – Government supported mortgage insurance will no longer be offered when the purchase price of the home is greater than one million dollars. – The gross debt service limit will be set at 39%, down from 44%. With the implementation of the new rules, the idea is to keep Canadians’ monthly housing costs under 39% of our monthly gross income. And, this is meant to include not only mortgage payments, but property taxes and heating costs as well. According to financial experts, we really should not be spending more than 33% – one third – of our incomes on housing costs. As with any new rules, there seems to be some debate as to how these changes will affect people. People who were pondering buying their first home might find themselves in a position where they have to put their plans on hold for a while. People who were considering refinancing may be reconsidering. But, all in all, are these new rules for the greater good of the Canadian economy? Please take our poll below to let us know how you feel. 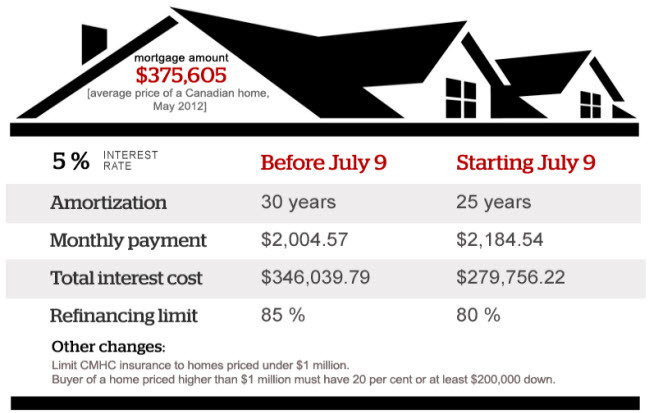 This entry was posted in Real Estate and tagged Canadian economy, New Mortgage Rules. Bookmark the permalink.